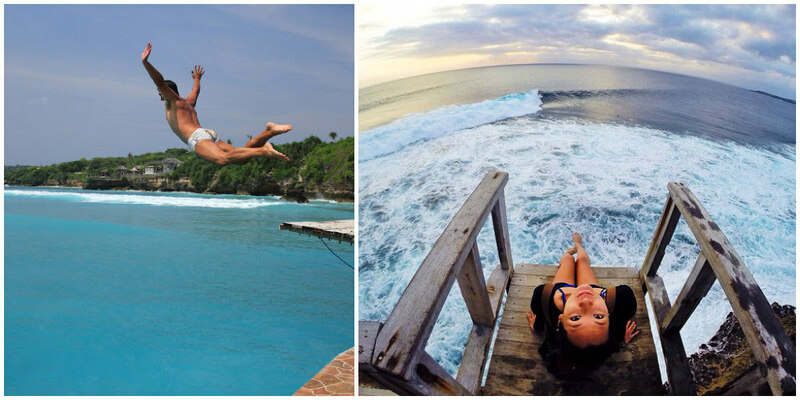 So you have visited all of the Bali’s main attractions, tried surfing and still feel like something is missing? 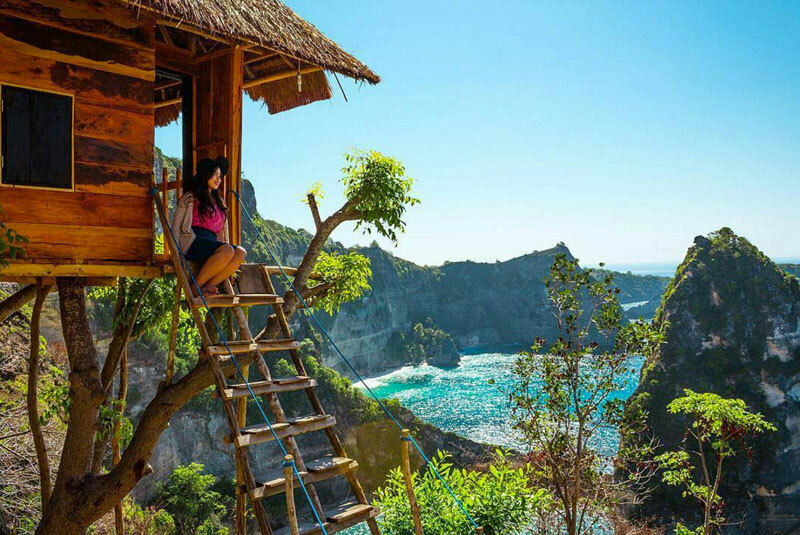 Are you searching for a hidden paradise in or around Bali where you can escape the hordes of tourists? 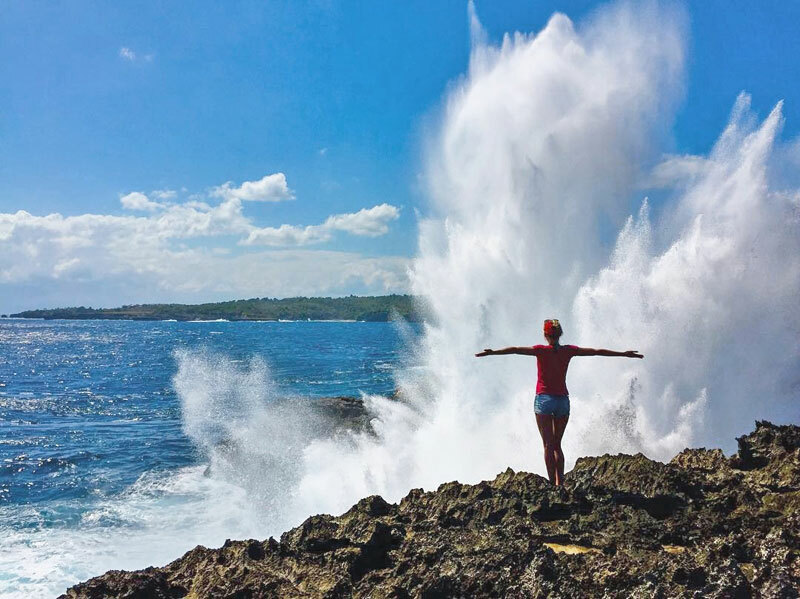 All you need to do is to board a ferry from Sanur or Padangbai, and you will be transported to the Nusa islands, off the coast of Bali’s main island. 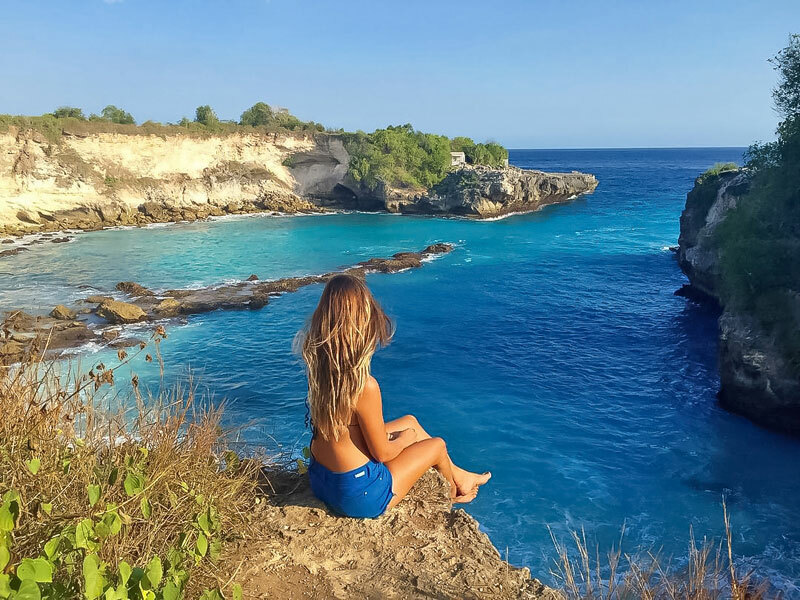 Part of Bali, the cluster of three Nusa islands consists of the larger Nusa Penida, and the smaller Nusa Ceningan and Nusa Lembongan. You will feel as though time has stopped here – how we imagine Bali to be years ago, before bustling tourism flocked to the island. Although getting around may not be very easy, as the paths may be rocky and slippery, you will find Nature’s biggest wonders, and very often you may be completely alone. No need to stand in line to take a picture. 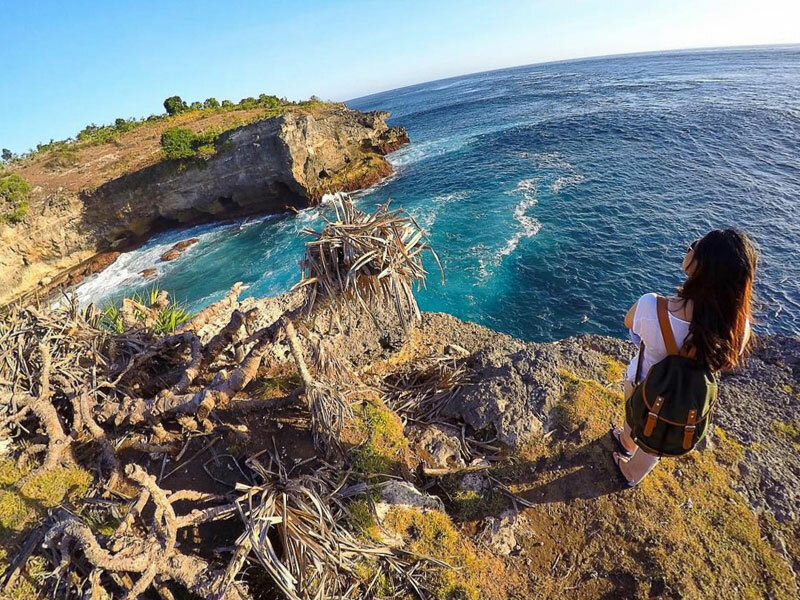 It’s time to step out of your comfort zone and explore the real Bali, untouched and unspoilt! 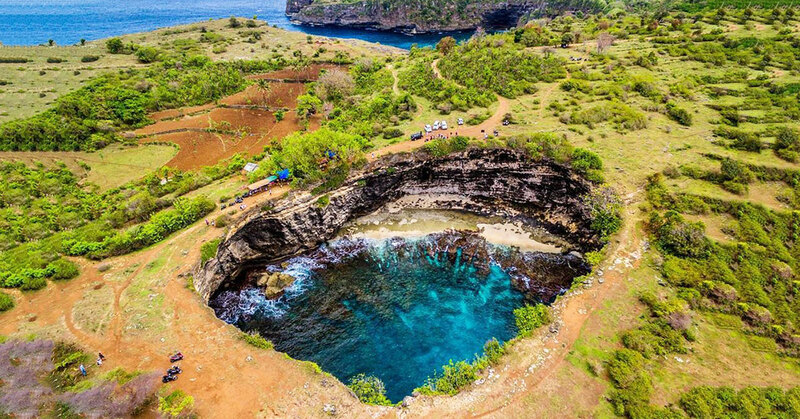 Pasih Uwug, also known as the broken sea, is one unique attraction in Nusa Penida that happens to be a cool geological phenomenon. Why is it known as the broken sea? 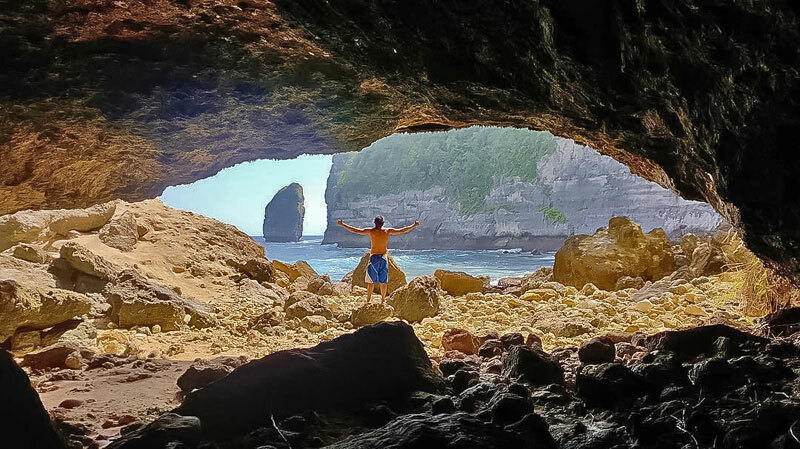 On first sight, you’ll see a natural arch created by the rock cliffs. The arch – or the hole in the rock cliff as some would say – actually used to be a cave! 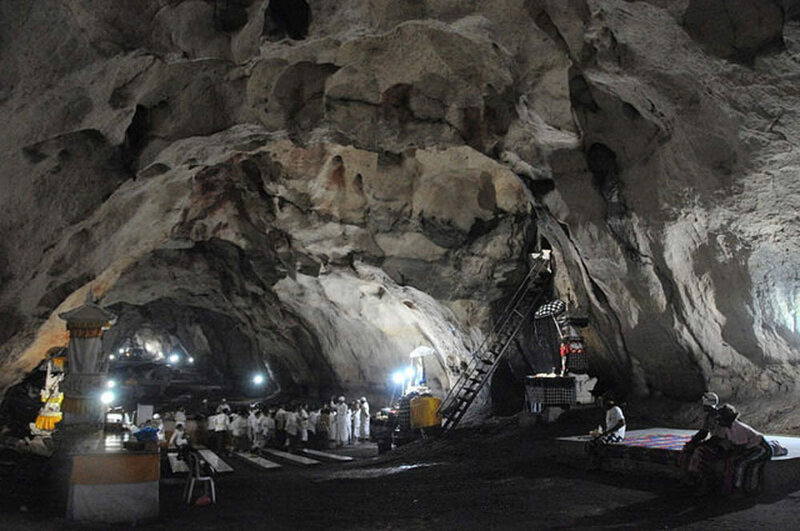 The floor of the cave had collapsed, creating the arch we see today. 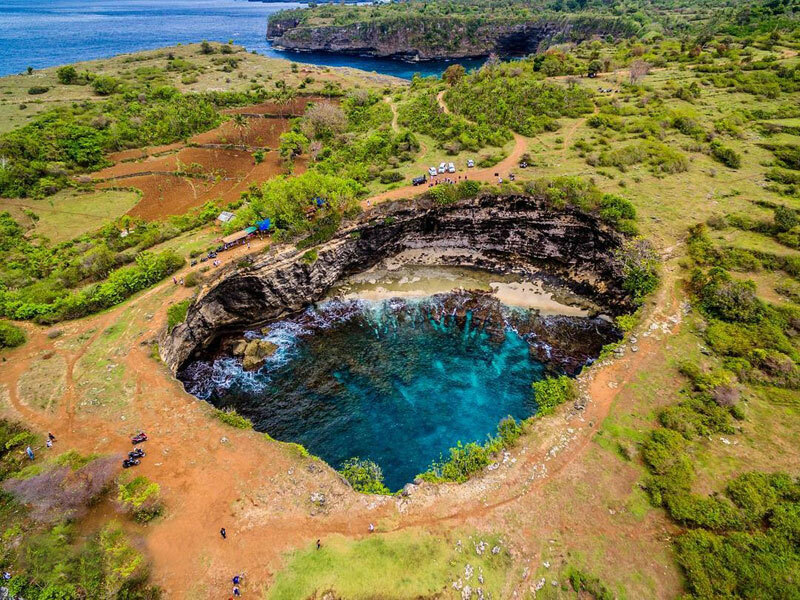 The hole in the cliff has also allowed ocean waters to flow through – creating a gorgeous natural pool on the other side to marvel at, and even swim in! So you want to get a taste of the best thrills on the island? You can experience ‘gliding’, ‘sea’, ‘zipline’, and ‘cliffs’ all through one activity – The Abyss Zipline. 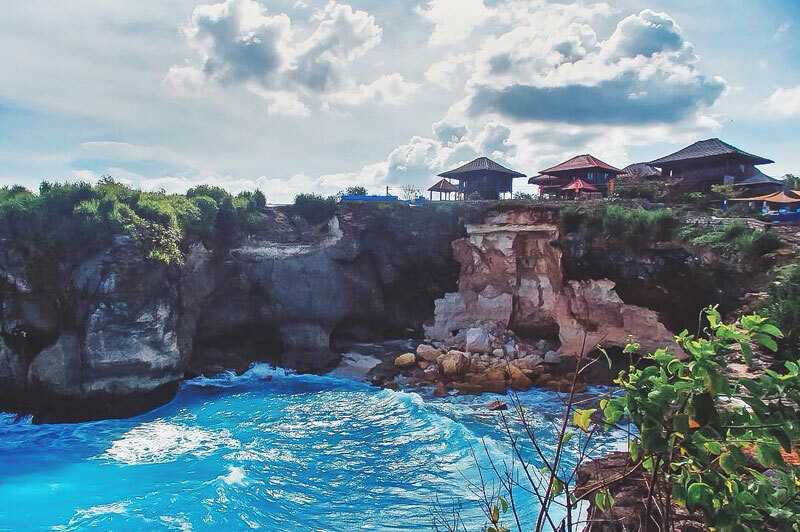 Nusa Ceningan and its sister, Nusa Lembongan, are famous for their cliffs and crashing waves. 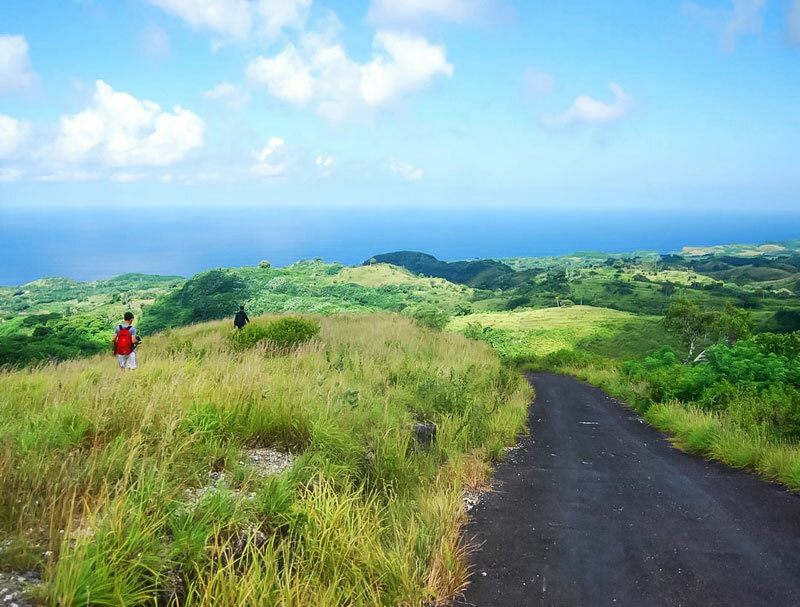 Imagine enjoying that spectacular scenery while gliding along a zipline. How cool is that! The staff will be on hand to ensure safety, and you will be attached to the line by two cables. But there’s always a little possibility of danger, of course. That’s why it’s a thrill ride! 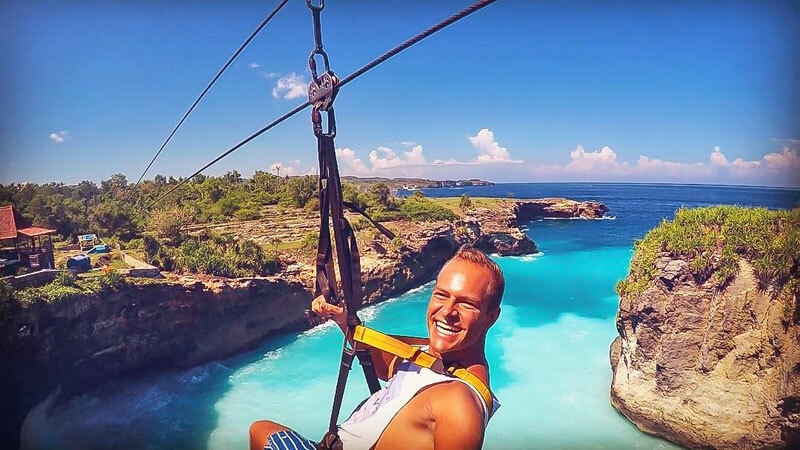 This place definitely takes zipline to a new level. Interested to try out this extreme flying fox? 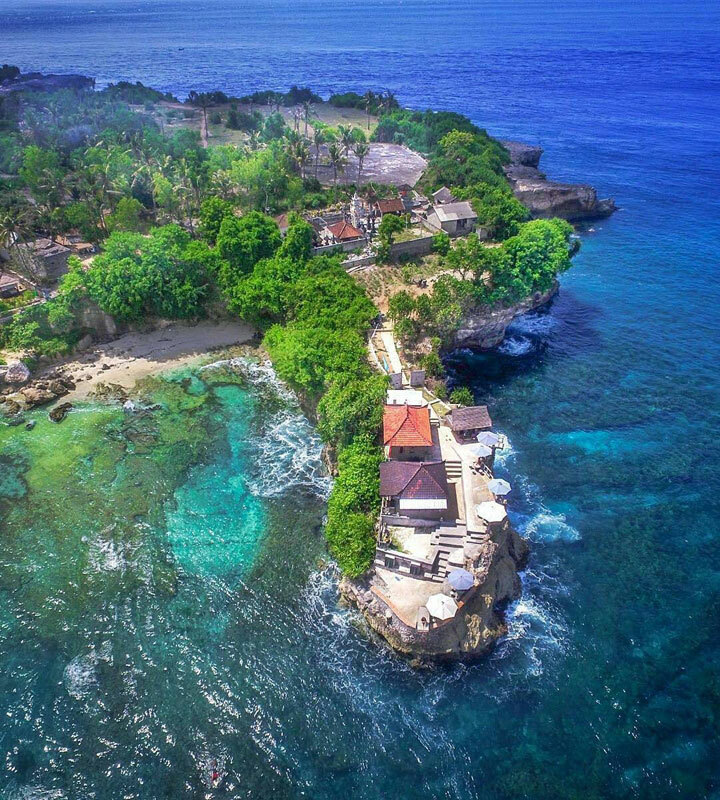 Getting there: Nusa Ceningan is a separate island located south of Bali, next to Nusa Lembongan. 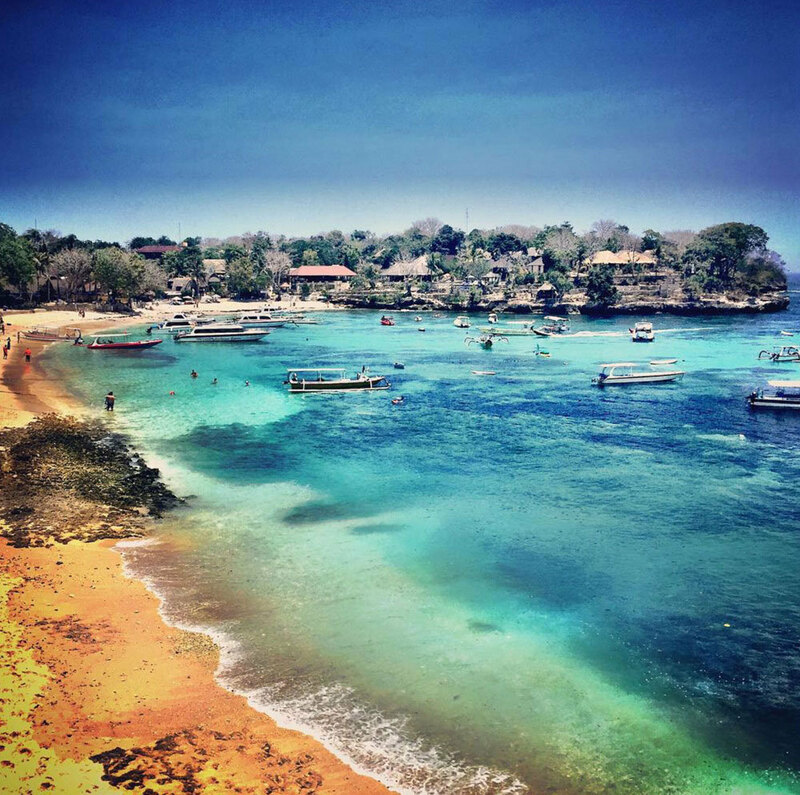 The most common way to get to the island is to take a ferry from Sanur Beach or Benoa Harbor to Nusa Lembongan. Then, you need to rent a scooter (you can’t use a car) to cross the yellow bridge, before you arrive at Nusa Ceningan. Follow the sign to reach the resort. If you don’t ride, you can arrange for a pickup service. Have you ever seen or heard of an underwater scooter?! Before we stumbled on this, we definitely hadn’t heard of this ourselves. 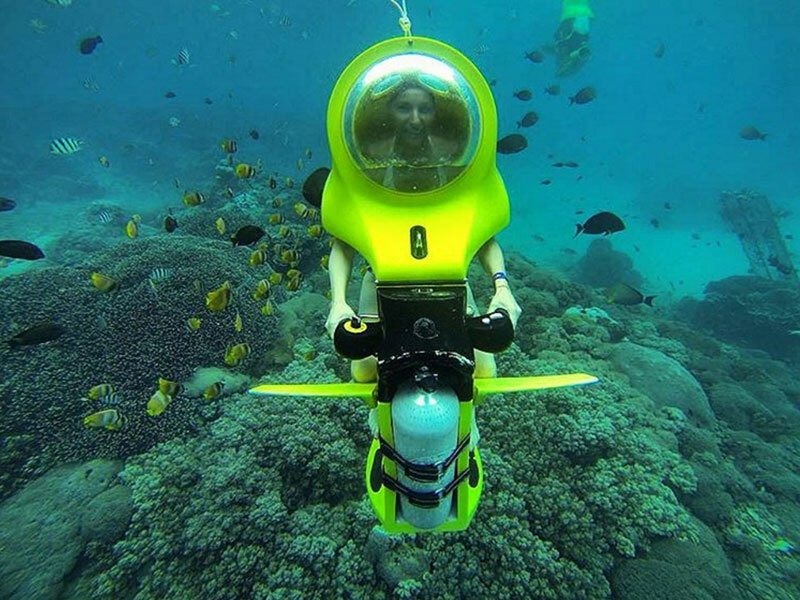 It looks super fun and looks almost like your personal one-man submarine. Imagine you and your friends all on your underwater scooters floating over the sea beds… Now wouldn’t that make an interesting photo for Instagram! 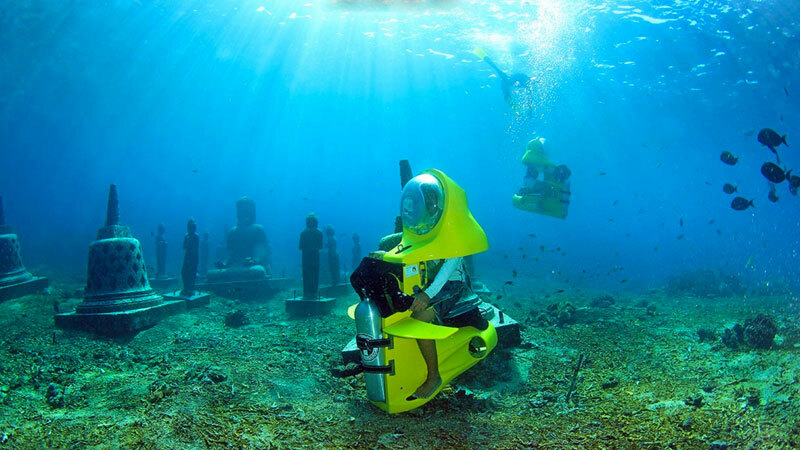 The underwater scooter is perfect for those who want a good scuba diving experience that’s not as demanding (read: no certification, experience, or troublesome gear attached required) as when you actually scuba dive. All you need to do is sit, and you’ll be able to breathe comfortably in your personal ‘head bubble’ that thankfully provides very clear visibility and distortion-free views! 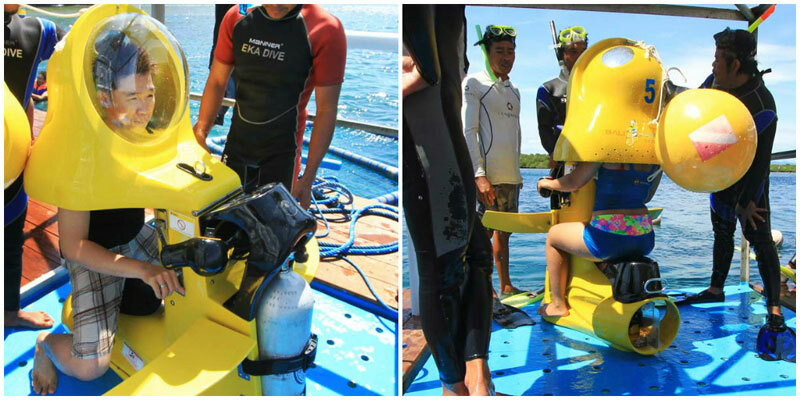 The underwater scooter travels at up to 2km/hour, and it can go down to 20m depth so you’re able to access the shallow reefs! And just like a standard motorbike, simply turn the handlebars to go where you want to go, and easily press the buttons for more speed or depth. 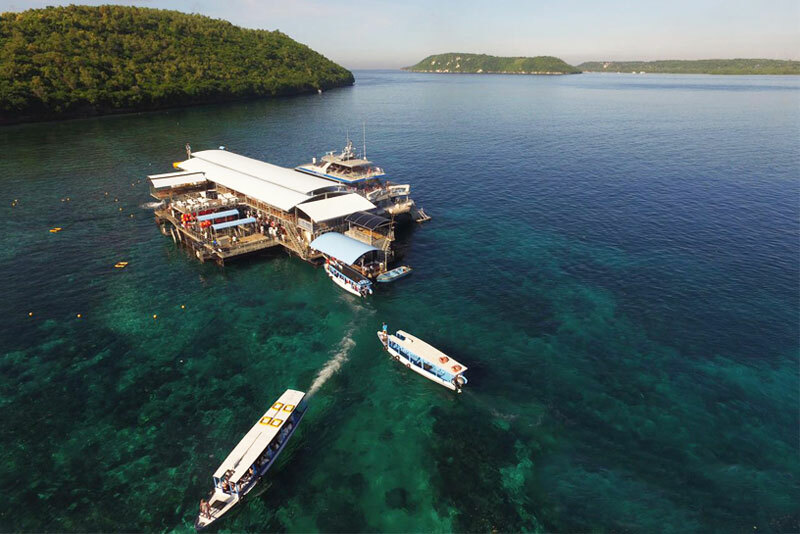 For those who always wanted to scuba dive, but might’ve been scared off by the requirements – here’s your chance! Want to embark on an adventurous cruise? With Quicksilver cruise, kids can cruise along the sea like a pirate, and they pay only half price! And what’s more, they will have lots of fun sliding down right into the sea on the 60-metre-long curvy waterslide! The ship sets off in the morning from Benoa village. 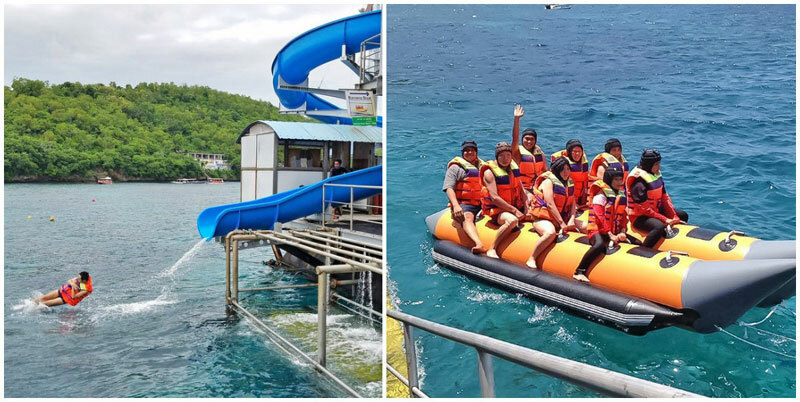 You will be served breakfast, and during the ride to Nusa Penida, you can ride on a banana boat or watch the underwater life through the windows – just like being in a submarine! 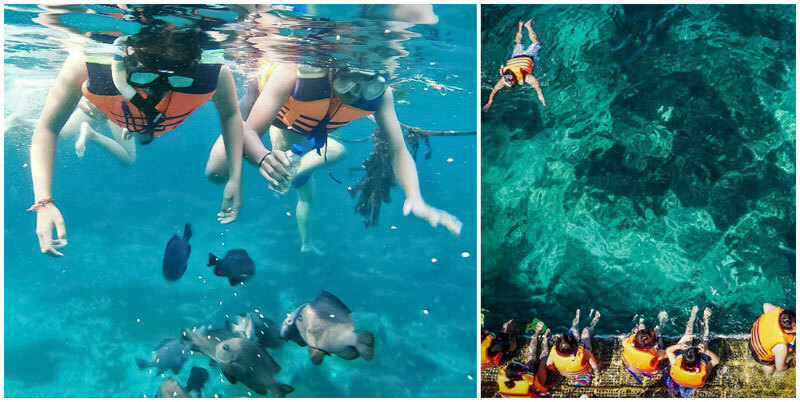 The cruise makes stops for snorkelling and a guided tour of a local village. You will see the seaweed farm and a Balinese temple. And if that’s still not enough for you, you can pay for additional scuba diving, jet skiing, banana boat or fish feeding experience! Free pick-up is provided from Kuta, Sanur, Nusa Dua and Jimbaran. Address: BALI OFFICE Jl. Raya Kerthadalem No. 96 Suwung, Sidakarya, Denpasar 80226, Bali, Indonesia. While many waterfalls hide in the jungles, Seganing flows down from the cliff right into the sea. 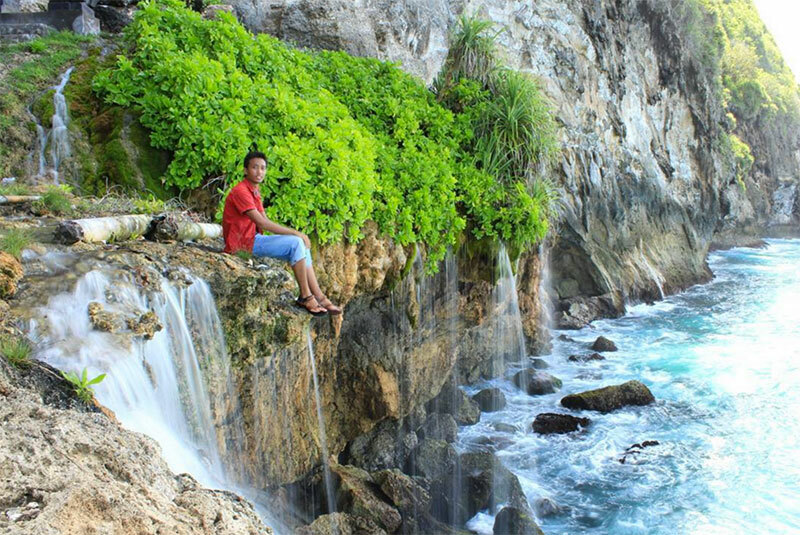 The water has found its way between the rocks and created a beautiful natural scenery. 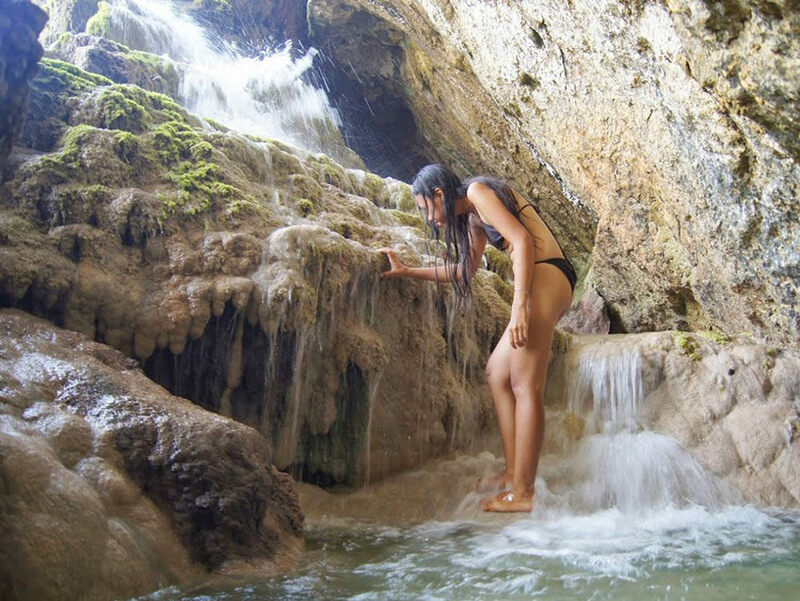 The waterfall is not easily accessible, you will have to climb a long flight of stairs and the path is slippery and may be a little dangerous. 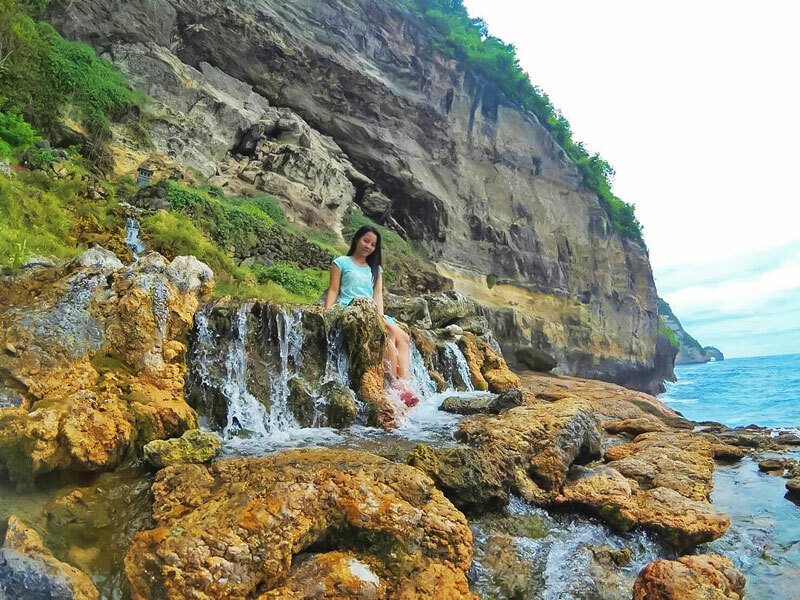 But as it’s said, difficult paths often lead to beautiful destinations, so if you manage to make your way to the waterfall, you will be rewarded with one of the best views in Nusa Penida. 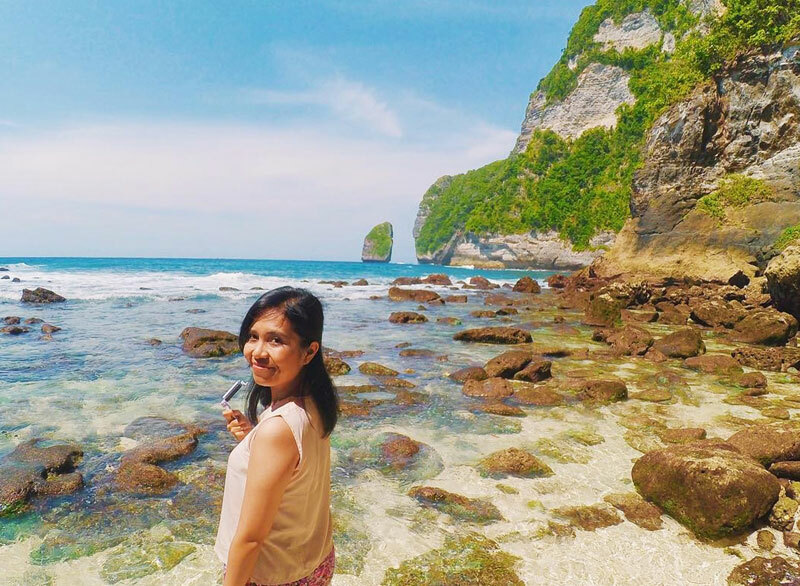 It’s almost everyone’s dream to discover a beach that no one knows about. A place where worrying is forbidden and all troubles are washed away with the turquoise waves. 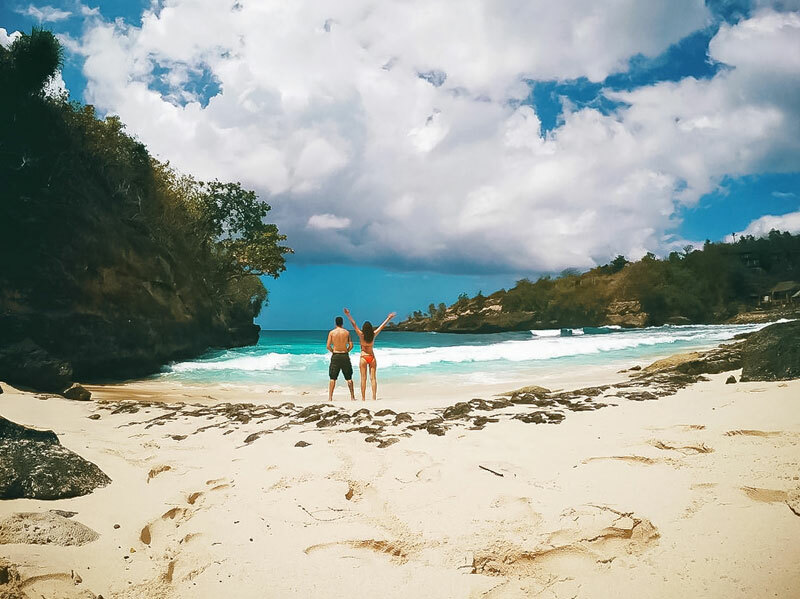 At Secret Point Beach, you’ll fall in love with the white sand and crystal clear water. 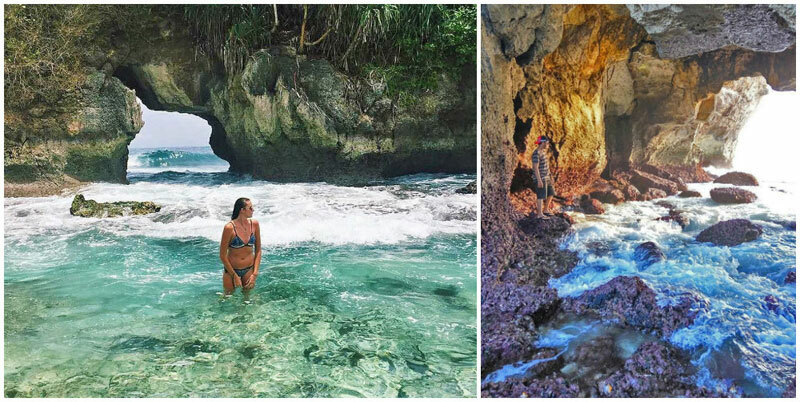 Explore the little cave, collect seashells on the sand, drink from a cold coconut and soak up some Bali sun. Getting there: From Secret Point Hut, follow the signs to the beach. Imagine that! 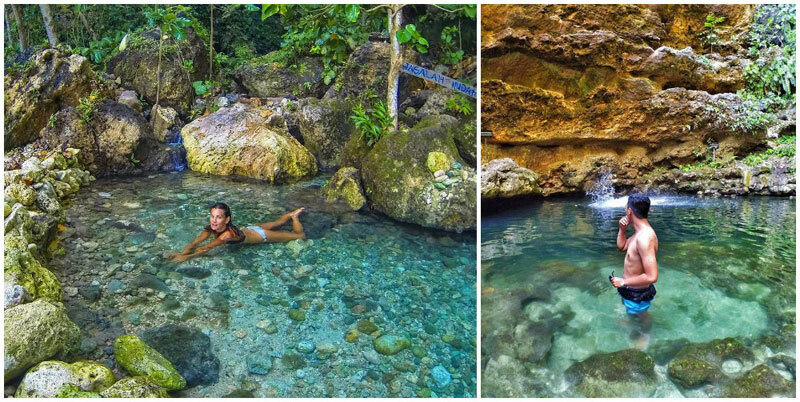 We sure wish we were lounging around at Angel’s Billabong this very moment. 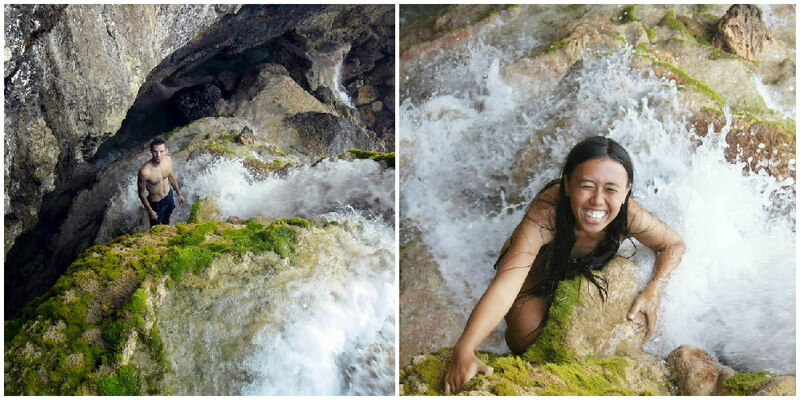 PS: Do note that Angel’s Billabong can be dangerous. There have been people swept out to the ocean by waves rushing in! Getting There: It’s not too far from Pasih Uwug (the broken sea). 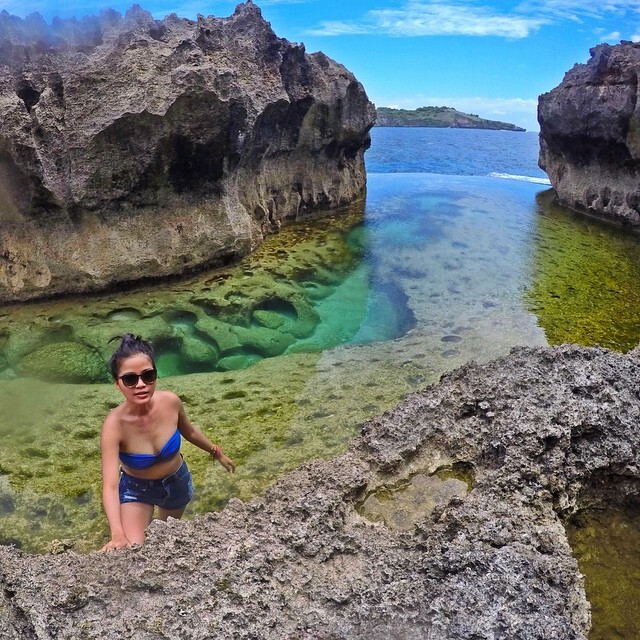 A half-kilometre walk from Manta Point to a nearby reef, climb down one of the sides of the edgy coral walls to swim in this surreal pool. 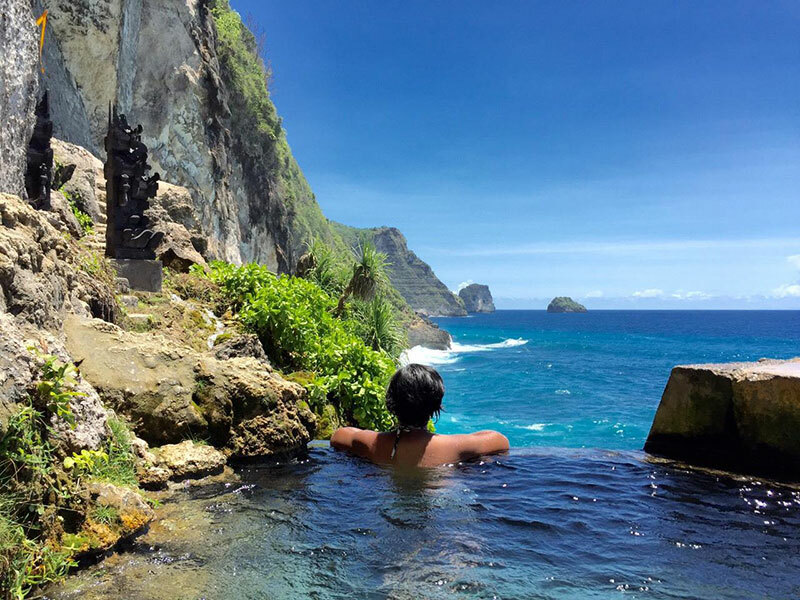 Not far from Angel’s Billabong, a natural infinity pool in Nusa Penida, lies this awesome forgotten spot where you can watch a majestic natural phenomenon. 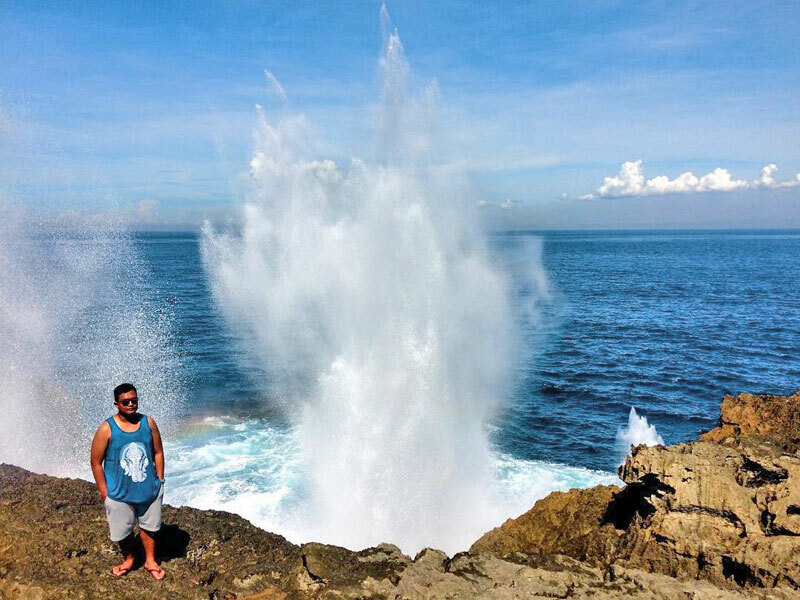 Pasih Andur (also known as the Smoke beach) is a place on the top of the cliff where the rock breaks the wave and jets the water into the air. Just watching the water burst into immense height pumps a bit of adrenaline into your veins and makes you realise how powerful the ocean can be. Linger there for a while, listen to the rumbling sound of the sea, and if you dare, take a picture with the huge waves behind you. 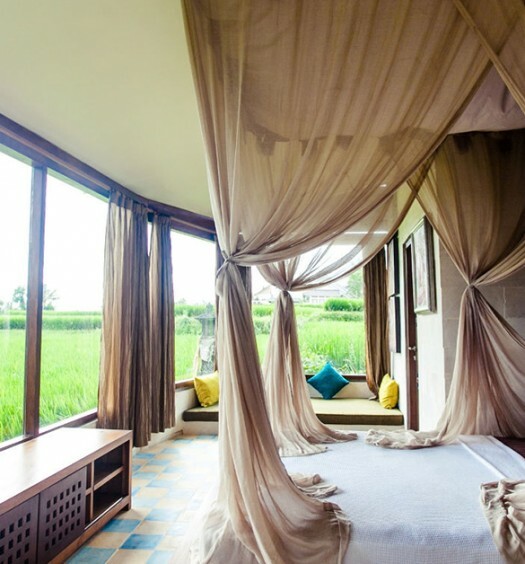 For the Balinese, Tembeling is a sacred place, used for rituals during the Keagamaan ceremony. 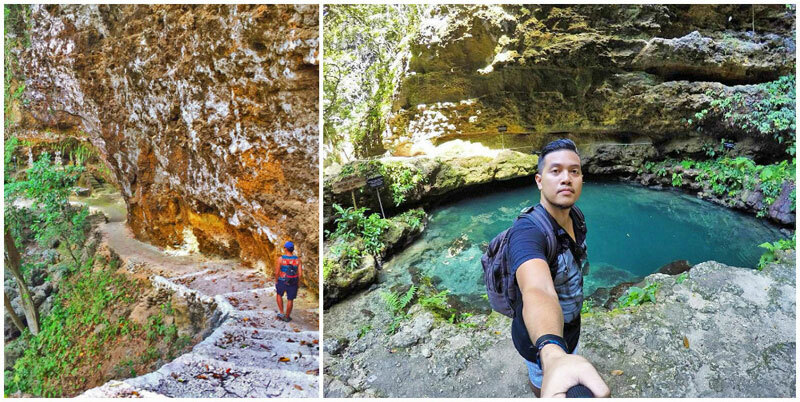 In the forest, there are two hidden natural pools with water so clear that you can’t resist jumping into them. Legend has it that they were discovered by a pregnant woman who was chasing a cow. Later on, locals used it as a source of drinking water. 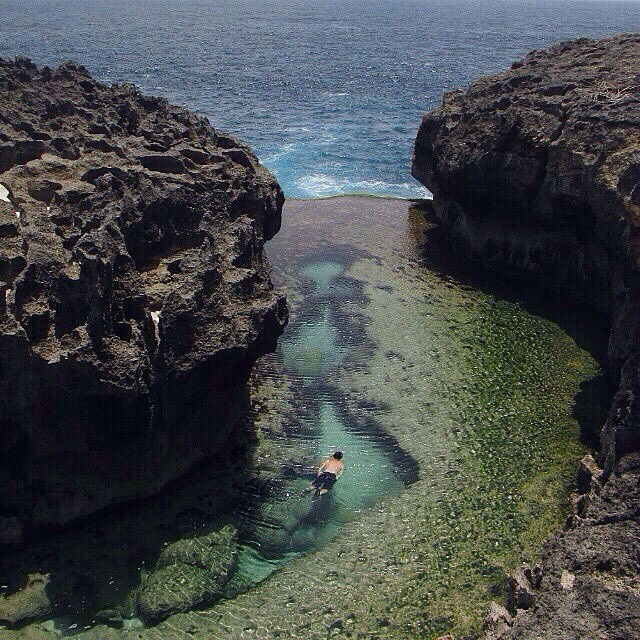 Nowadays, it has become a place sought by travellers craving for a swim in this unique secret spot. But keep in mind that the big pool is for men and the small one for women only. Continue walking to the very end and you will come to a beautiful rocky beach. You may very likely find yourself completely alone there. It’s time to discover the beauties of the underwater world! And you don’t even need to be a scuba diver. Goggles with simple snorkelling equipment would be enough. 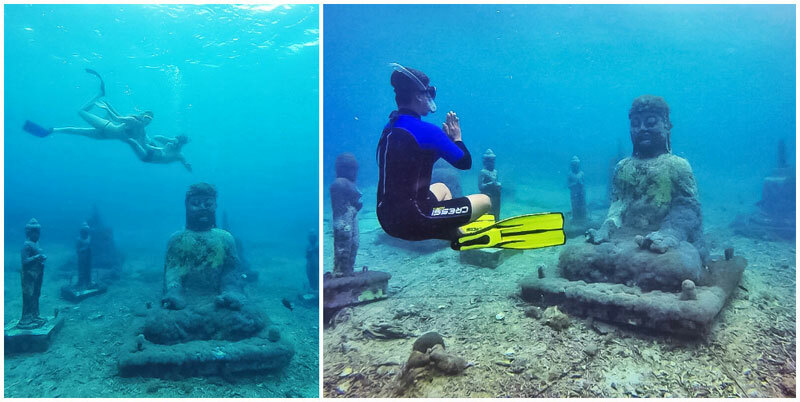 Book a snorkelling boat trip from Crystal Bay in Nusa Penida and meet the underwater Buddha, sitting there in peace and surrounded by statues. Regardless of how real it may appear to be, the underwater temple is just an installation. 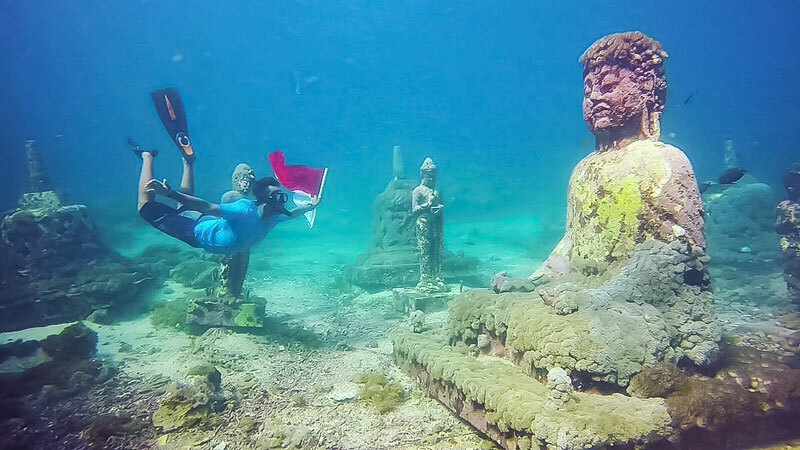 The statues were put here as an art exhibition, an attraction for tourists and for conservation of the reefs. But you must admit – this is still an exciting attraction to visit! On most hidden islands, you may think that you can only find nature’s wonders along the shores. But did you know that the inland lush green landscape can be so photogenic too? 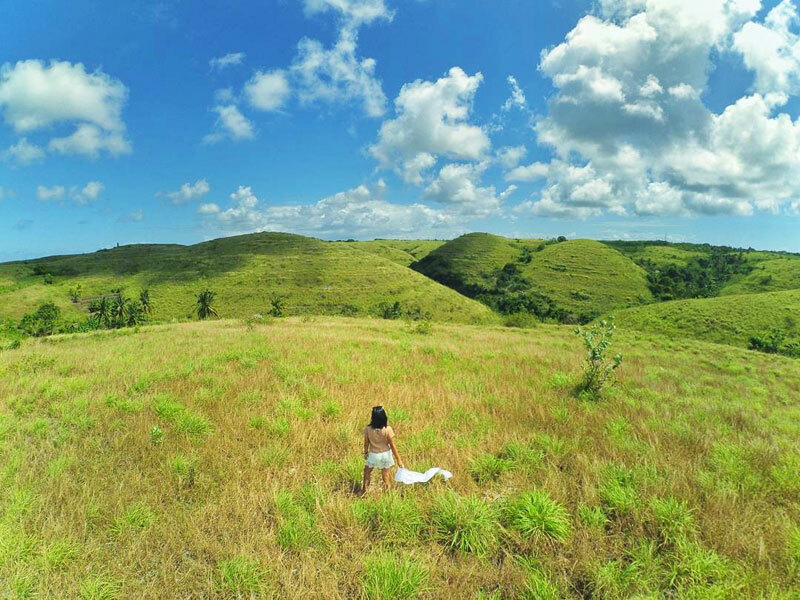 A cluster of unusually shaped conical hills have been curiously bestowed (we’re not sure by who exactly) with the name Bukit Teletubbies. The name is a reference to the rounded green hills that were home to the fuzzy aliens from the children’s television program with the same name. 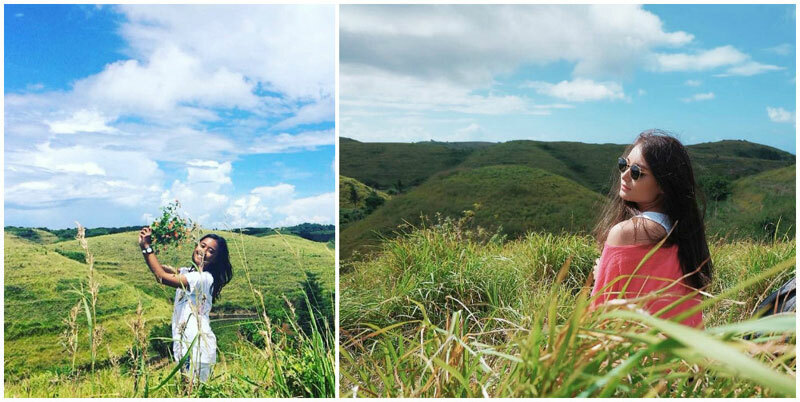 The best time to visit Bukit Teletubbies is during or just after the rainy season, when the hills are a vivid green and most resemble the cutesy world of our gobbledegook-speaking space critters. 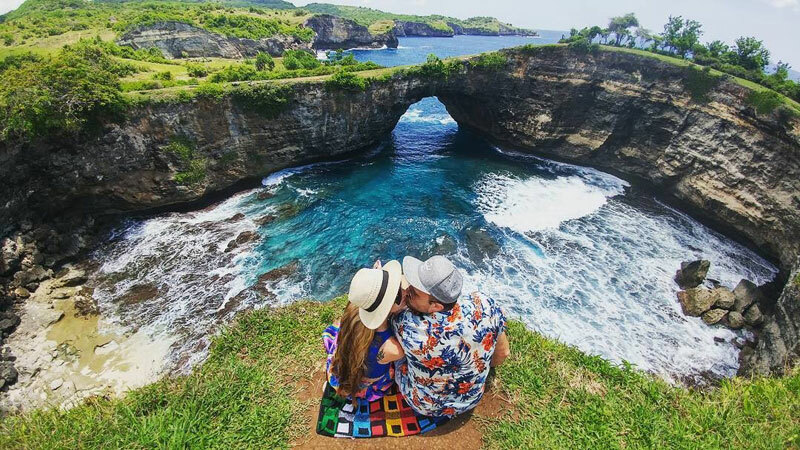 The Banah Cliffs of Nusa Penida rise mightily out of the whirling ocean and are perhaps the most dramatic coastal cliffs in Bali. Hundreds of metres high and draped in lush green vegetation, they make an astonishing sight seen from the water. When you’re standing on top of them, they are even more imposing with no barrier between you and the abyssal drop below. Looking out from Banah Cliffs you’ll see an unusual rock formation – a pretty, tiny islet in the middle of nowhere, twisted into shape of an arch. 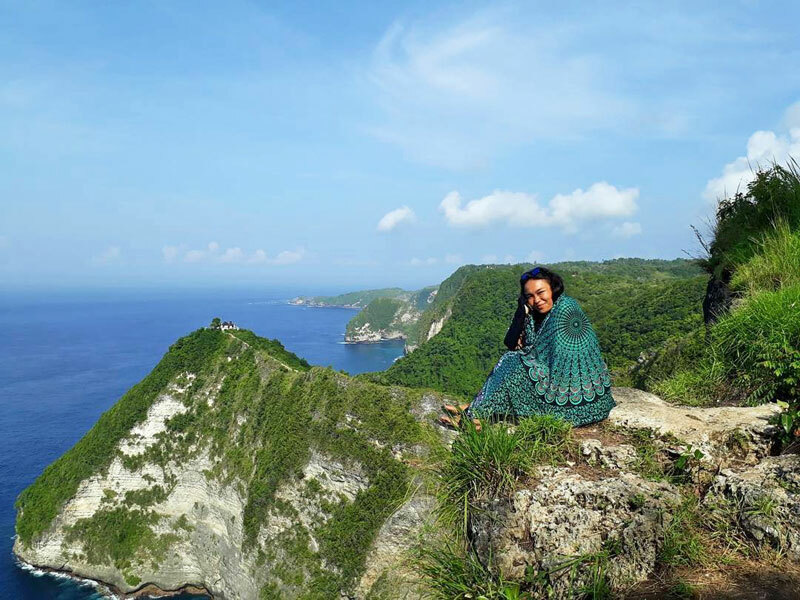 Yet another mysteriously captivating wonder of Bali. Daredevils, here’s your calling. 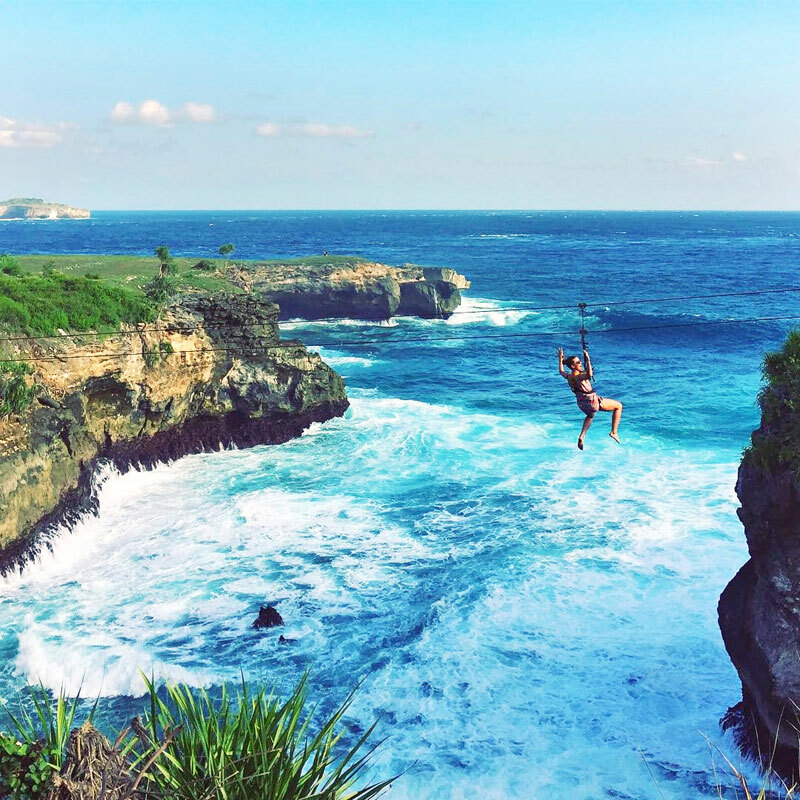 Fancy jumping from a high cliff top into clear blue waters below, as the world around you spins and shifts? 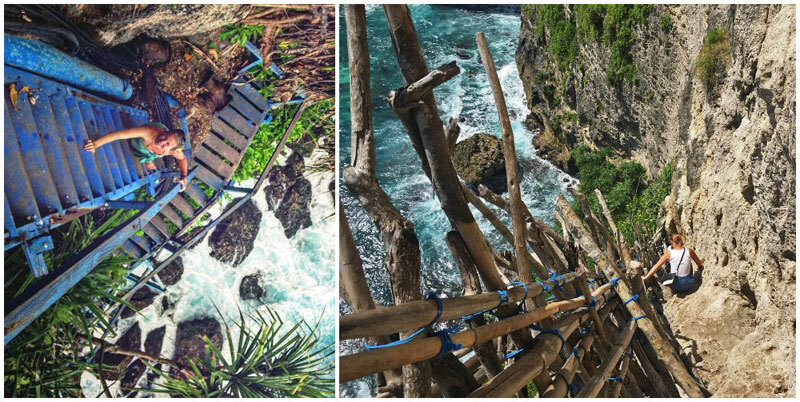 Mahana Point, a little bar located on a cliff top in Nusa Ceningan, gives its customers a chance to do exactly that. If the sight of other brave jumpers have already got your blood racing, kudos to you! And if you’re not sure whether this is a good idea yet, you could always have a drink or two at the bar to boost your courage. You can do it (or you could just sit back and watch the surfers ride the waves)! The Mushroom Beach is the perfect alternative for the popular Jungutbatu and Dream beaches. With shimmering white sand and the occasional banana boat sighting, the waters are great for a swim during high tide. To get some quiet time to yourself, head out in the early morning or evening. 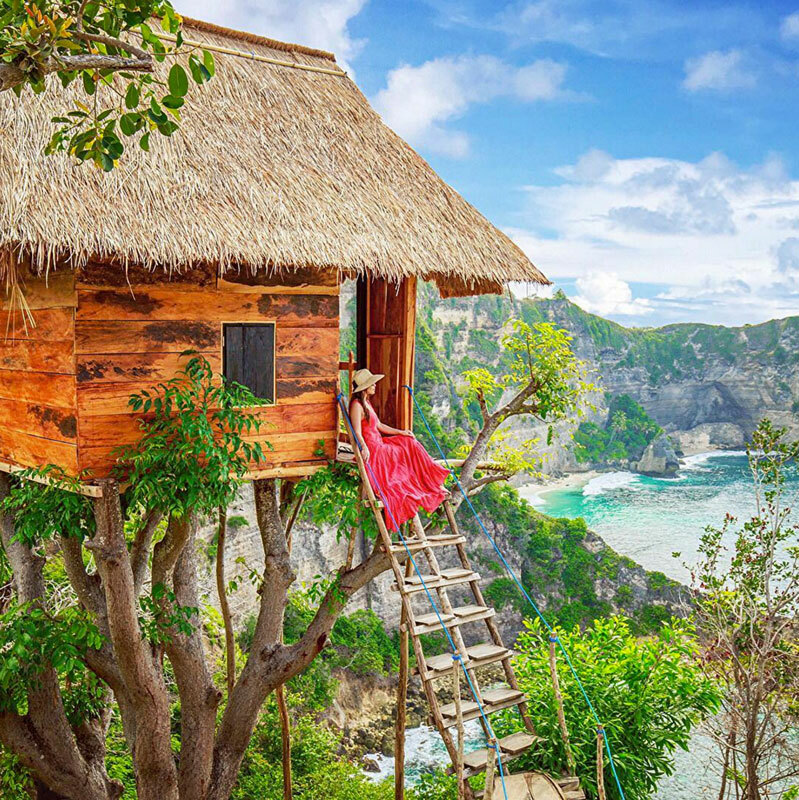 If you’re after a relaxing day out instead of anything too strenuous, why not try a scenic boat ride or kayak through Nusa Lembongan’s iconic mangrove forest? All you have to do is sit back and breathe in the nature all around you – perfect for soothing frazzled nerves. 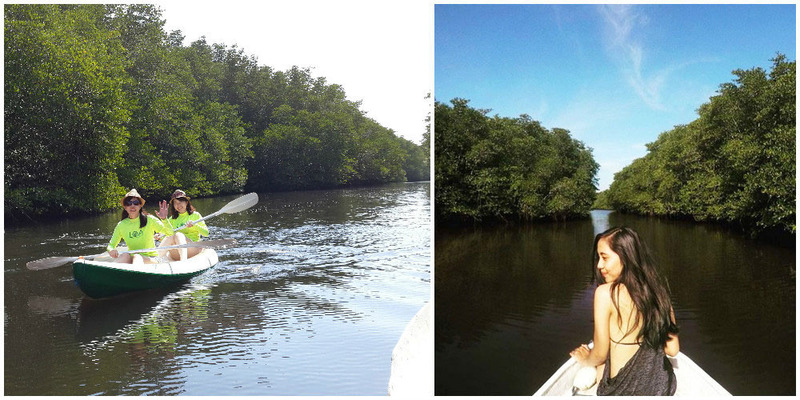 Price: 20-minute boat tour from Rp. 150,000 for two persons (Approximately USD $10.75) Note: Prices are negotiable. Getting there: From the main street at Jalan Jungut Batu, it’s about two kilometres to the mangrove forest area, an easy walk, cycle or motorbike ride. Plenty of local boatmen will approach you. 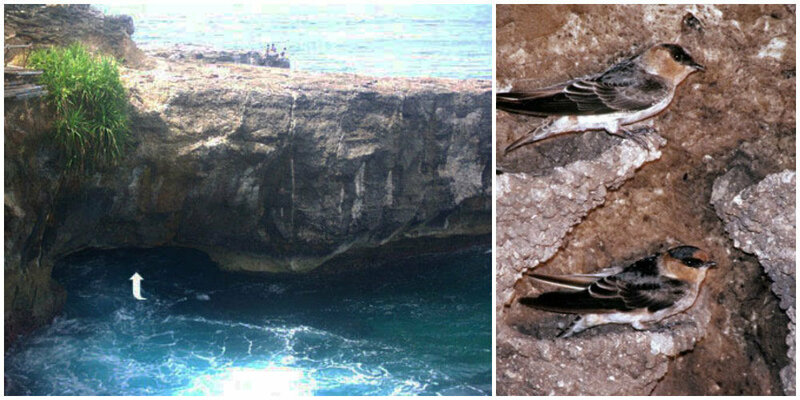 There is a little miracle of nature located in the western part of Nusa Ceningan – a swallow cave that can only be accessed by man at low tide. If you visit the cave at sunset, you might even get to witness the majestic sight of swallows flying around it! You’ve probably been to one of the magnificent temples located around Bali; after all, these old infrastructures are an integral part of local culture. 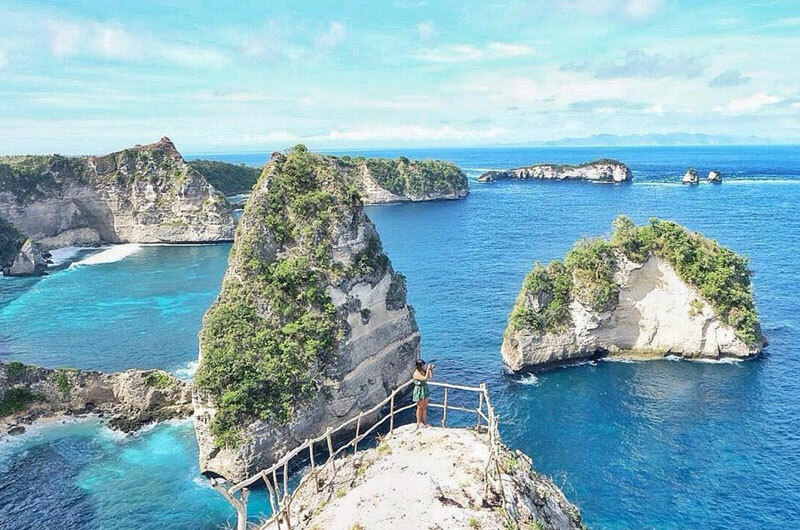 However, the Giri Putri Cave Temple in Nusa Penida is not just your regular temple. Just as its name states, it’s located inside a cave, and you’ll even have to crawl through a 2-metre long tunnel to get inside! Fascinating, isn’t it? Please note that a sarong and belt are required to be allowed entrance. 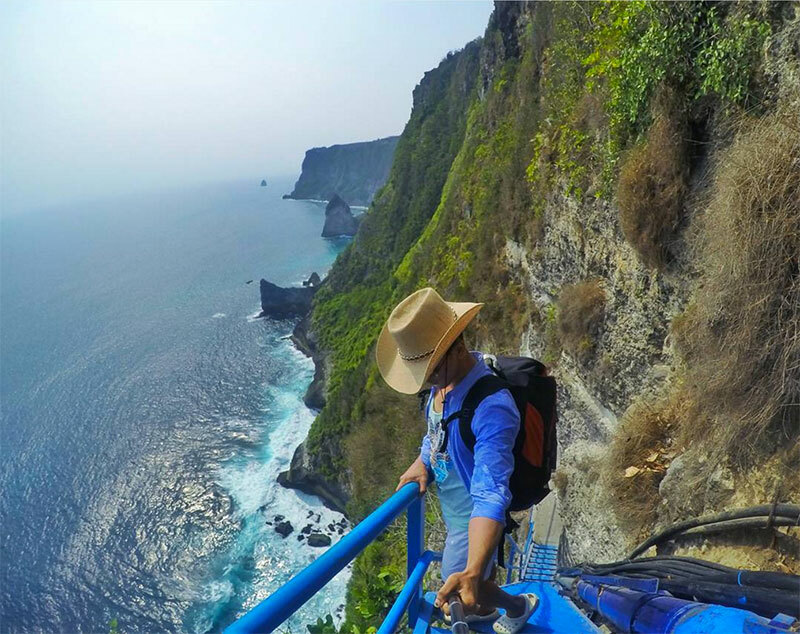 Do you know of any other adventurous activities you can do in Nusa Islands? Do share them with us!